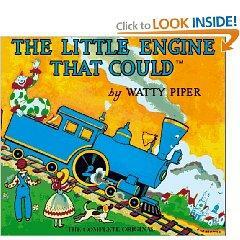 Watty Piper's The Little Engine that Could is a sweet motivational story worth of a special place in any child's library. Sales for all published versions of this wonderful book exceed 20 million copies. Sometimes referred to as The Pony Engine, The Little Engine that Could is a children's book about a long train that must be pulled over a mountain. Various engines are asked to pull the train, but they all refuse to help for different reasons. Finally, a small engine agrees to try to pull the train. The little engine works hard, but eventually succeeds in pulling the train over the mountain while repeating the famous motto, "I think I can." The engines in the story are anthropomorphic, which means that they are given human personality characteristics. This is similar to the popular character Thomas the Tank Engine, although Watty Piper's The Little Engine that Could appeared a decade before the first books in the Railway Series. Today, the little engine in Watty Piper's story is sometimes called Tillie. However, the character is not named in the original children's book. The name Tillie comes from a 1991 animated film adaptation of the classic tale. In addition to the classic story The Little Engine that Could, you can also find the same characters featured in spin-offs such as The Little Engine that Could: I Can Spell, The Little Engine that Could: I Can Count, and A Train of a Different Color. Fans of The Little Engine that Could are often shocked to realize that Watty Piper is not an actual person. The name is a pseudonym for the publishing house of Platt & Munk. Today, Platt & Munk is owned by Penguin Putnam Inc. The first edition of The Little Engine that Could was published in 1930. Mabel C. Bragg was credited as the originating author of The Little Engine that Could. Ms. Bragg, a school teacher in Boston, Massachusetts, never publicly claimed credit for the story, however. A lawsuit following the initial success of the book created even more controversy surrounding the authorship of the tale. In 1949, Elizabeth M. Chmiel began claiming her cousin Frances M. Ford wrote the story under the pseudonym Uncle Nat. In 1953, Grosset & Dunlap tried to publish a version of the tale under the title of The Little Engine that Could that credited Ms. Ford as the author. Platt & Munk sued to block publication of the book. Eventually, it was decided that Grosset & Dunlap could publish the book under the title The Pony Engine. The book was published in 1957, although Ms. Ford passed away in 1956 at the age of 102. Why didn't the shiny engine stop to help? Why didn't the black engine stop to help? Will the blue engine stop to help? Will the blue engine be able to make it over the mountain? What are some of the events in this story that could happen in real life? What are some of the events in this story that we know are made up? Feel free to use the story as a starting point for talking with your child about overcoming obstacles to reach a goal. Teachers often used The Little Engine that Could as a basis for teaching about the value of optimism, hard work, and persistence. Some scholars have even claimed the book serves as a metaphor for the American dream.